Rev up those fryers because I sure am hungry for a new cooking-style game! It was announced on the 25th issue of Weekly Shonen Jump magazine that Shun Saeki’s upcoming popular franchise Food Wars: Shokugeki no Soma will be getting it’s own video game for the 3DS. The game’s title Shokugeki no Sōma : Yūjō to Kizuna no Hitosara ( Food Wars: Shokugeki no Soma : The Dish of Friendship and Bonds). Developer Furyu desires to create a “personal experience cooking battle adventure” with this game. The company plans to release Food Wars this winter. 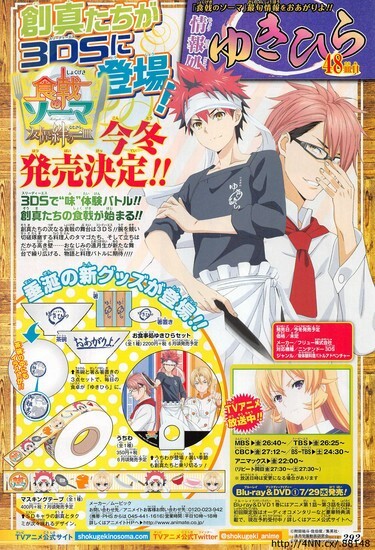 The game will star the protagonist Soma Yukihira and other familiar faces who attend the legendary Totsuki Culinary Academy as they wage war in the kitchen. If you haven’t watched Food Wars yet, I highly recommend doing so. It’s a series of laughter, bizarre “tasting” scenarios, and of course, imagination that inspires trying out some of the recipes shown in the show.